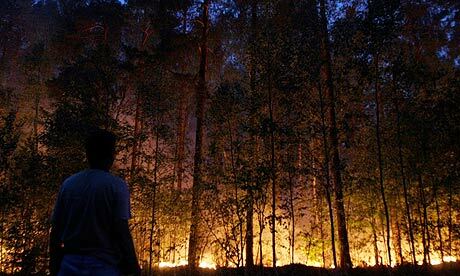 The extreme Russian heatwave of 2010 was made three times more likely because of man-made climate change, according to a study led by climate scientists and number-crunched by home PC users. But the size of the event was mostly within natural limits, said the scientists, laying to rest a controversy last year over whether the extreme weather was natural or human-induced. The 2010 heatwave broke all records for Russia – temperatures in the central region of the country, including Moscow, were around 10C above what they should have been for the time of year. More than 50,000 people died from respiratory illnesses and heat stress during that time. The temperatures also had a substantial impact on that year’s Russian wheat harvest, leading to economic losses of more than $15bn. Two studies published in 2011 looked at the causes of the extreme weather, but they disagreed on whether it was a natural event or whether it was a result of anthropogenic climate change. A separate study by Stefan Rahmstorf of the Potsdam Institute for Climate Impact Research near Berlin suggested otherwise. “What they [said] was that the risk of the heatwave occurring had gone up by a substantial factor, the odds of it occurring were 80% due to the large-scale warming trend and, of course, most of that large-scale warming is attributed to human influences on climate,” said Allen. To resolve this apparent condundrum, Allen and his team ran a series of climate models that simulated the weather in different parts of the world, using observed data from the 1960s and the 2000s. This allowed them to observe the frequency of extreme weather events in Russia during each decade, with and without the effects of the warming due to human-induced climate change. In terms of size, the 2010 heatwave was mostly natural. In terms of probability of the event occurring at all, the risk had been increased caused by human activity. The latest study, published in the journal Geophysical Research Letters, was carried out with the resources of the Weather at Home project, which runs regional weather models on the idle processing capacity of the home computers of volunteers. Members of the public can download some software that runs atmospheric models of Europe, southern Africa or the western US, to a resolution of 120km.